Libraries Ready to Code (RtC) is an initiative of ALA that is sponsored by Google. This initiative focuses on the role of school and public libraries in providing opportunities for youth to develop computational thinking skills through coding activities and other computer science programs (Be a Libraries Ready to Code Champion, 2017). 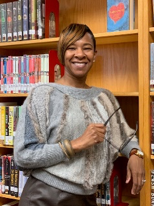 Melanie Toran is one of the Libraries Ready to Code (RtC) cohort members. During the third phase of the RtC initiative, Melanie, along with 26 others, were chosen to receive a grant funded by Google. The grant allowed Melanie to create a coding program at Heritage High School in Newport News, Virginia. Melanie is the Lead School Librarian at Heritage High School. She will admit that coding was fairly new to her before becoming a member of the cohort. This was part of her motivation to apply for the grant. 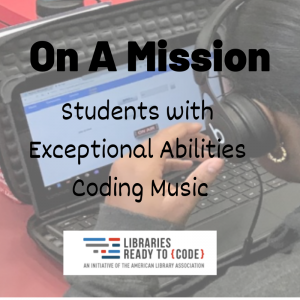 After receiving the grant, she created the program Mission Possible, which combines music and coding to teach computational thinking literacies to students with moderate intellectual disabilities. Or as she refers to them as students who are exceptional learners. Below you will find what Melanie had to share about her experience. I partnered with EMA, Music & Arts Founder and Director, Joshua Head. He developed a new app, GROOVECODERS, that helps instructors teach students to write original music in pop, soul, hip-hop, gospel, and more. The app allows students to showcase their original music to their peers and industry coaches who give them feedback. The students who participated with Joshua and me in the library for this project continued coding in their classrooms. 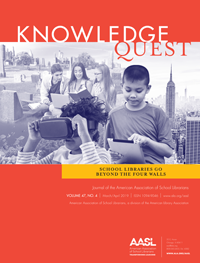 You could say that their classroom teacher and instructional assistants were “instrumental” in ensuring that what they learned in the school library was reinforced in the classroom. From building leaders, staff, and students, everyone has coded something whether it’s setting our alarm clocks or personalizing our devices to do, say, and look a certain way. To begin, I told my students that coding is giving something a set of instructions. We started with an unplugged activity. This means that we did not need any electronic devices. We simply had students code each other to get to their desks from the front of a classroom. Students needed to see how important it was to relay specific directions. After a few unplugged lessons, the students were READY TO CODE! 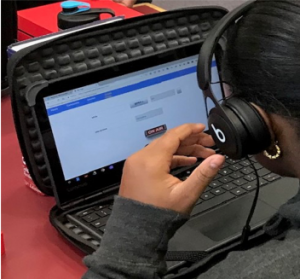 At Heritage High School in Newport News, Virginia, our students who are exceptional learners were given the opportunity to learn how to code music using unplugged activities and electronic devices. Exceptional learners are motivated by music because it encompasses a variety of sensory modalities including visual and audio. They can make music their own. Making music is simply using computational thinking to code musical phrases and loops on your electronic device and not being confined to monophonic sounds; monophonic sounds are just one tone, as opposed to two or more. 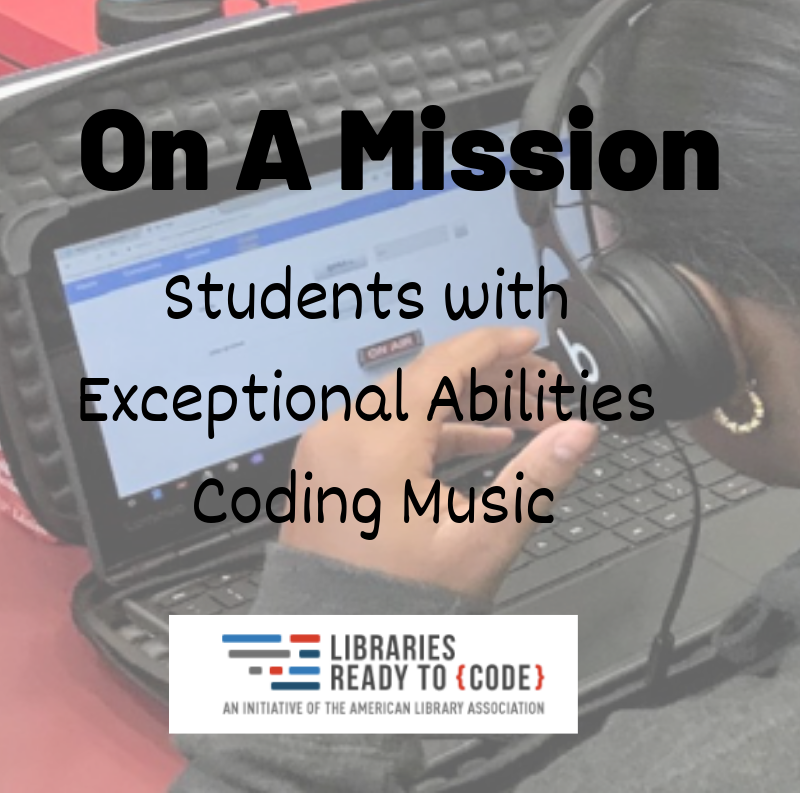 These eight exceptional learners with moderate intellectual abilities learned how applying computer science and computational thinking would result in making their own musical phrases. Our exceptional learners’ capabilities should not be underestimated. A 2012 study from the National Science Foundation calculated that approximately 11% of college students have disabilities and are what we consider exceptional learners. They are just as likely to pursue a field in science, mainly computer science, as their peers without disabilities (Cortez, 2017). 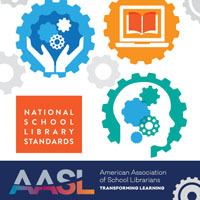 Assistive technology–that is anything from a simple pair of eyeglasses to a complicated speech synthesize–is available to exceptional learners and can help decrease their learning obstacles, thus boosting their confidence not only in the computer science fields and computational thinking required in coding but in all content areas. With this confidence and knowledge of 21st-century technology skills, they can enter higher education and ultimately the workforce as well prepared as their peers. Teaching coding to students with exceptional learning abilities is not impossible, but rather possible, manageable, and necessary for their future success! In most high schools, pep rallies are a time to show school spirit and let the good times roll. In our school of more than 1,200 students, there are eight individuals that everyone knows by name and expects to see at every pep rally. These students are given front row seats to ensure they are close to the floor, that way they can show off their rendition of the latest viral dances. From dub smashes to dance challenges, these students definitely tap into innate musicality. Choosing this group of students as my pilot group for coding was a no-brainer. Typically, they are conceptual thinkers, social and collaborative by nature, and retain prior knowledge, which are perfect traits for this type of program. Each week these students came to the library to receive coding instruction. Instruction included applying computer science vocabulary to code musical phrases. 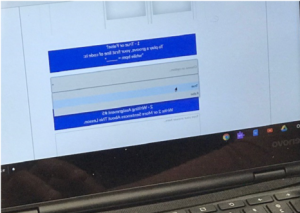 Additionally, they had to use computational thinking to decide which code to put into the computer to tell it what to do and when. 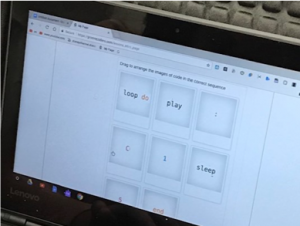 Coding music allowed the students to make musical phrases and loops on their school-issued Chromebooks. Coding on their personal Chromebooks did not confine them to just monophonic sounds and limited rhythms that are pre-set on some computers; they could listen to their own music that they coded. We used GROOVECODERS.COM to get a basic understanding of coding. GROOVECODERS.COM inspires users to learn the basics of programming vocabulary through computational thinking and coding using computer science skills and creation of original songs. There are more than twenty-five interactive lessons and assignments in each unit. 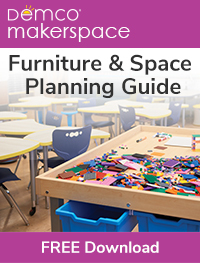 These assignments help users arrange musical phrases and “grooves” by coding commands and experimenting through investigation. After completing tutorials, users can effectively write short codes to play grooves and beats from a custom music library. I learned every day from the students. Coding is a part of this generation. 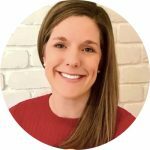 In order to meet the needs of my students, I felt I needed to catch up and quickly! I have learned it is OK to ask them for help and learn together. I am the first to admit that I am not as tech savvy as I should be and sometimes I work harder and not smarter. My “Groovers” remind me that if you know better, you will do better. It feels good to know that the students are not letting their exceptional abilities keep them from being productive citizens in the community and prepared for post-secondary employment opportunities. If they can GROOVE to it, Mission Complete! Cortez, Meghan Bogardus. “Accessible Technology Helps Students with Disabilities Pursue STEM Degrees.” 10 Mar. 2017. edtechmagazine.com/k12/article/2017/03/accessible-technology-helps-students-disabilities-pursue-stem-degrees.